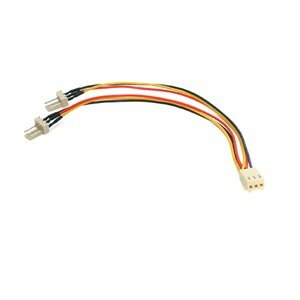 StarTech.com 12in TX3 Fan Power Splitter Cable - Boom I.T. The TX3SPLITTER 6in TX3 Fan Power Splitter Cable lets you connect two 3-pin (TX3) fans to a single power supply connector, allowing you to optimize your cooling capability without having to upgrade the power supply. The 6 inch Y-Cable extends the length of the connection from the computer power supply, offering greater flexibility in positioning the fans within the system case. Constructed of high quality materials to ensure long lasting performance, this 3-pin Fan Splitter is backed by StarTech.com's Lifetime Warranty. CONNECT 2 FANS TO 1 POWER CONNECTOR The StarTech TX3SPLITTER features one Molex Fan (3 pin; TX3) female connecter one end and two Molex Fan (3 pin; TX3) male connectors on the another end, allowing you to connect two 3-pin (TX3) fans to a single power supply connector. It is compatible with all CPU Fans with a TX3 Connector. FLEXIBILITY Featuring 6in connection length, the StarTech TX3SPLITTER offers greater flexibility to position Motherboard and CPU Fans for optimal cooling.